Given that my good friend Matakashi has already done a write up I am going to save myself some time and just post a whole load of pictures. Do drop by and read the report written by Matakashi and if you have ver been to his site before you are in for a treat ! A bit like London Buses, no sooner had I played one game of Saga this week another took place in the Shed two days later. This time my opponent was a good mate called Richard who I hadn’t actually caught up with for almost a year. It was great to catch up and roll a few dice. We decided to play a very simple scenario suitably titled ‘For the Victor, the Spoils’. 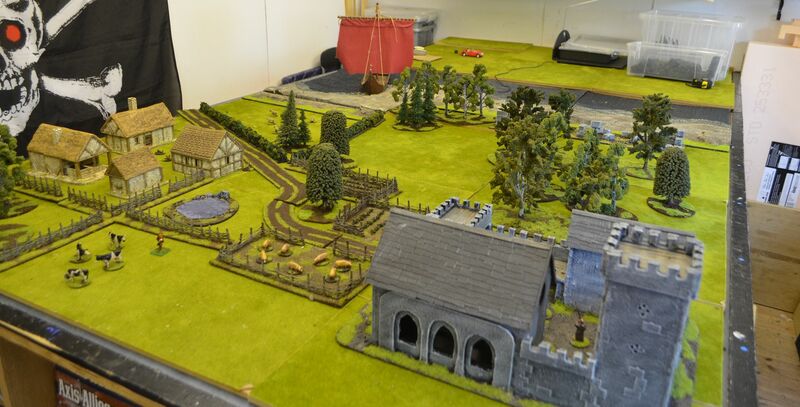 Because Richard hadn’t been to the shed for some time I decided to go the whole hog on the table and I laid out a fictitious coastal settlement complete with priory and village. 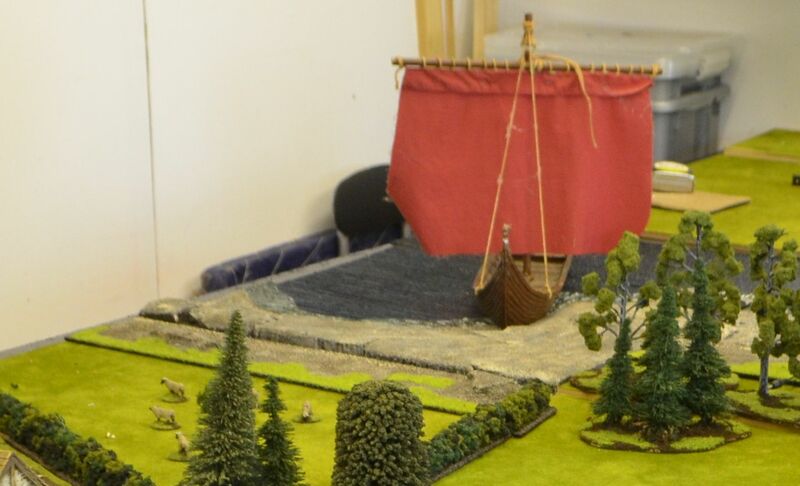 The grazing animals and hard working monks were about to have their day spoiled as a Viking longboat beached. 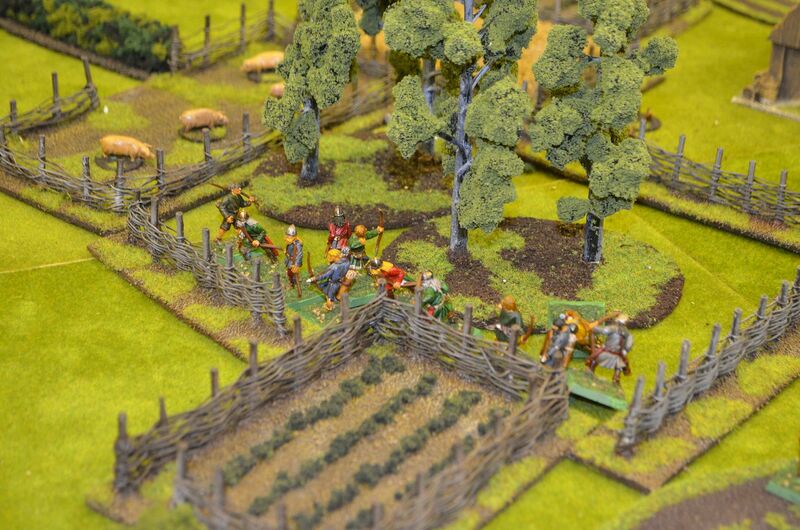 Help however was at hand as the local Anglo Dane warlord rushed to drive away the invaders. 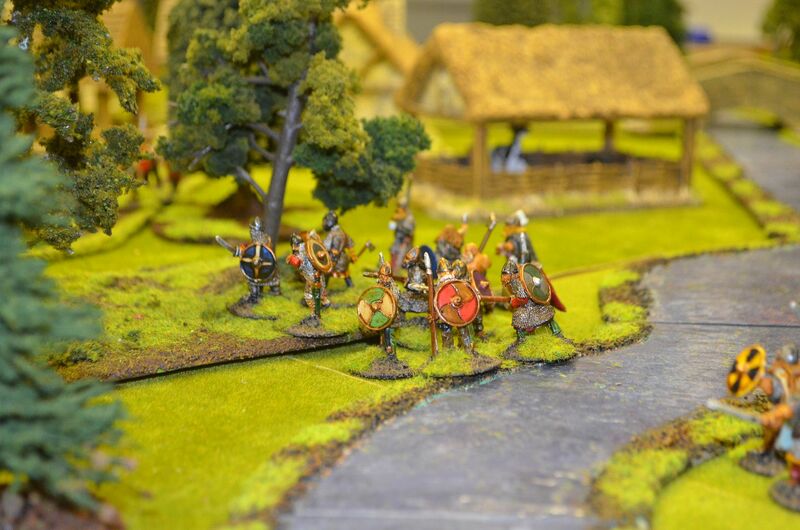 This time I have decided to write the AAR from the perspective of the Anglo Dane Warlord (Me) – I’d be really interested to get folks feedback on this style. October 21st in the year of our Lord 958. A cold bitter windswept in off the great Northern sea, a prelude to perhaps a bitter winter. The harvest is now complete and my men are slumbering peacefully in the great hall. The night before has taken its toll. The morning’s silence is broken by a commotion outside, and not before long a man, recognisable as a monk, rushes into the great hall - “A Dragon Ship My Lord”, with that his lifeless body crashes to the mead & reed covered floor. A black arrow jutting from his back. These words galvanise my men, armour is donned, weapons and harness grabbed and we rush to the muster outside the hall. A quick prayer to our lord (and secret oaths to the old gods are made) and we make our way towards the coast. 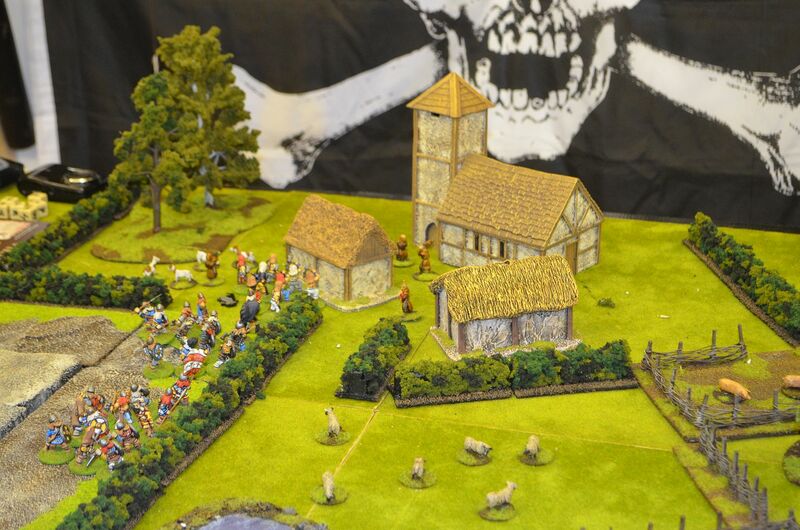 As we get closer we see the villagers rushing away from their homes and hovels. Their urgent voices telling of armoured and painted men coming ashore and forming up in battle lines. They are readying themselves in the common field alongside their ship. Breaking my forces in two I urge my bow armed levies to seek cover in the nearby woods and a band of trusted warriors to guard our flank along the beach by the old ruins. I, along with my personal guard would defend the field outside the priory. I make a mental note to send carpenters to fix the wooden doors of the stone building for surely if these were in place we would be able to avoid a pitched battle. As the mist rises we see the Northern banners flutter in the stiff breeze. Their bearers edge forward with purpose. 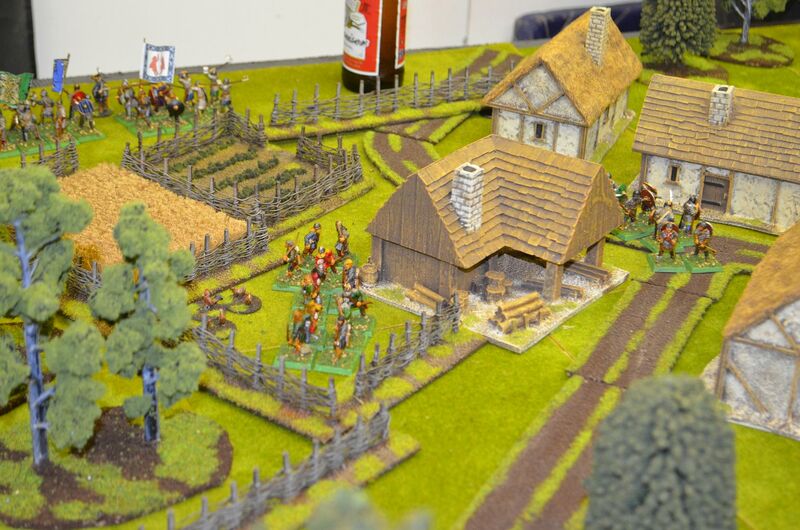 From my position I see a body of lightly armed thralls cross towards the village. 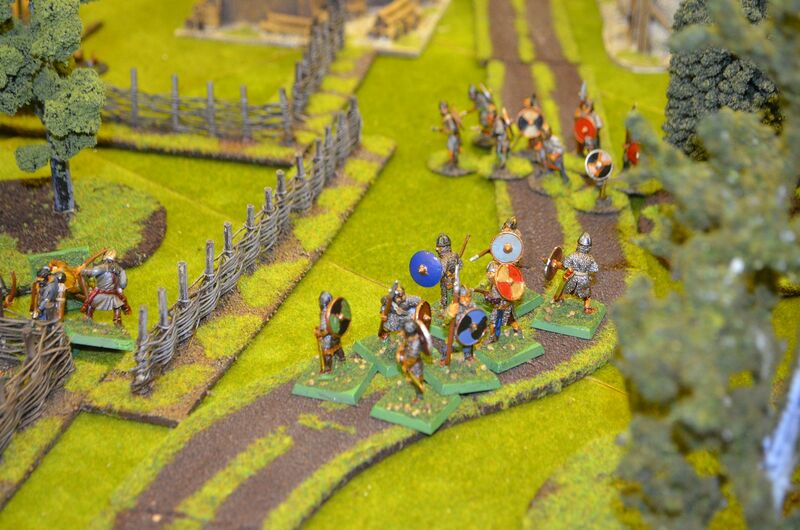 Keen that my forces are not flanked I send a small band of warriors to cut off their route. Running up the priory road they cut off this advancing party and from the sounds of friendly cheers I learn we are victorious. First blood to Christ. 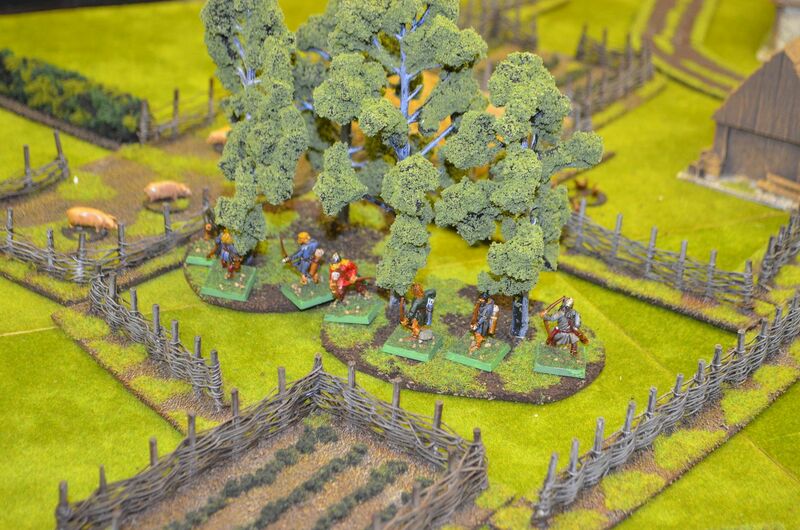 Gazing across the front of the woods I see a band a fearsome North men break cover and charge across the open ground. 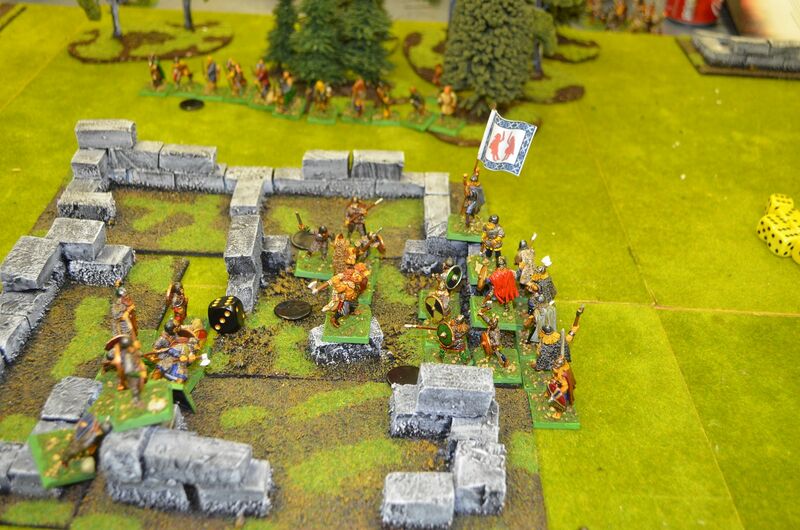 Supported by their own bows they crash into my warriors on the right flank. 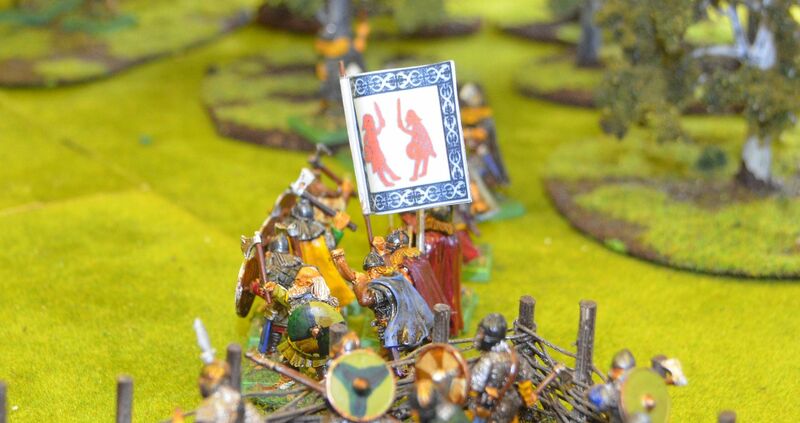 My men, the young men I have personally trained for a day such as this throw up their shield wall, but it is to no avail as arrows and blows rain down on their position. The same pagans then turn their attention to my thralls who have emerged from the woods. Again the story is the same, what can stop these dreaded savages. Why did I not fix those gates? Recognising that the initiative was slipping, I turned my attention to the defence of my battered force. I was given heart by the presence of my most trusted guard, my best warriors. We could still beat these invaders. Flush with the scent of victory a band of Vikings charged forward, I kept my lines straight and these Northmen died on the points of my spears. With a cry of havoc I urged my men forward, more blood was spilled, both Heaven and Valhalla were going to be busy on this day. Remnants of these Viking war bands streamed from the field, we could never quite finish them off. Before we could draw breath a band of mead soaked berserkers crashed into my lines. Their ferocity was like Satan himself had joined the fight. My men were desperate, my men were dying, I should have fixed those gates. One final push, that’s all it would take to end this battle, to drive the heathen from our shores. Could I and my guard force the day by killing the Viking chief. We charged again, For God, For Christ...we clashed, swords and axes renting mail, splintering shields and cleaving helms. The ground sticky with blood, choked our advance. We stopped, no I stopped for I was alone, exhaustion creeping through my limbs, with a heavy heart I turned to face the invader and the remains of his force. He smiled, he saluted and turned away. I stepped forward to strike, but my sword fell from my hand. Three dark arrows had stopped me in my path. I to would be joining the monk, who no doubt would ask as we meet at the Lords house – why did you not fix the gates? First up I apologise for the lack of posts in the last few weeks, to be honest by the time I have sweated my way back home out of London on South West Trains the only things I have wanted to do are to crack open a cold lager and have a shower. The idea of painting, terrain building or even just mucking around in the shed have been at the back of my mind. However I have put this lack of mojo behind me and hopefully the next few weeks will see some increased activity. Interestingly the lack of posts don’t seem to have dented the number of hits the blog has been achieving on a daily basis. Averaging over 150 a day suggests that the content I seem to have amassed is still generating interest. I am also pleased to be on target to achieve the goals I set my self for the end of the year (both hits and followers). 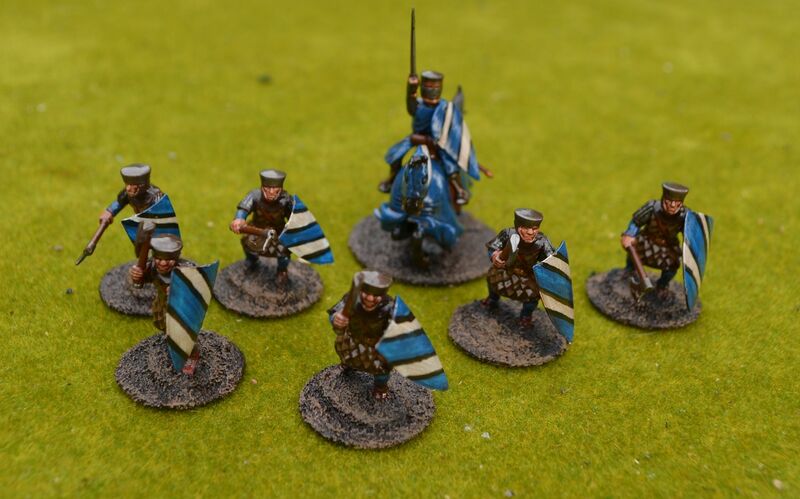 The big project on the go at the moment is my ‘tales of Shedwood’ – I have almost finished the men at arms and knights and whilst clearing out the shed I found almost 30+ peasant type figures I’d bought from Black Tree many moons ago. These will serve well as villagers and other serfs. All I need to find are Robin Hood and his merry men. 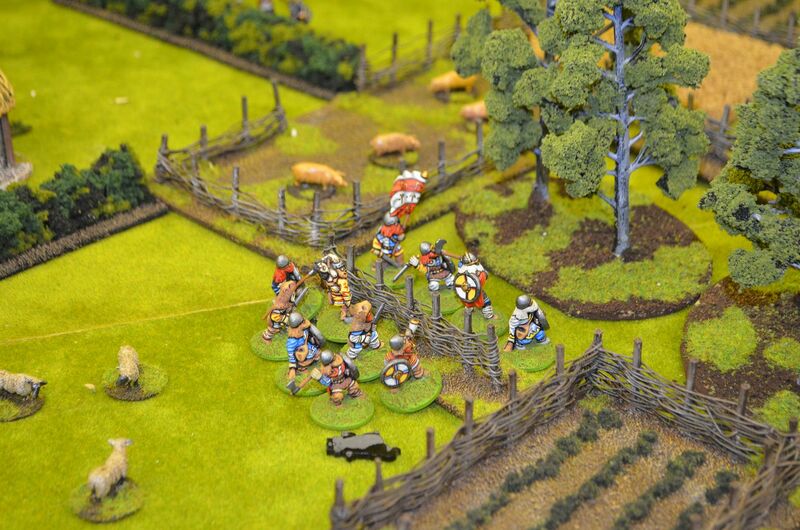 On the gaming front most of the action has been focussed on Saga – I think I have posted three AARs, all tight games and there is another waiting to be posted in the wings. It is a great game and I would whole heartedly recommend this for any Dark Age fans. 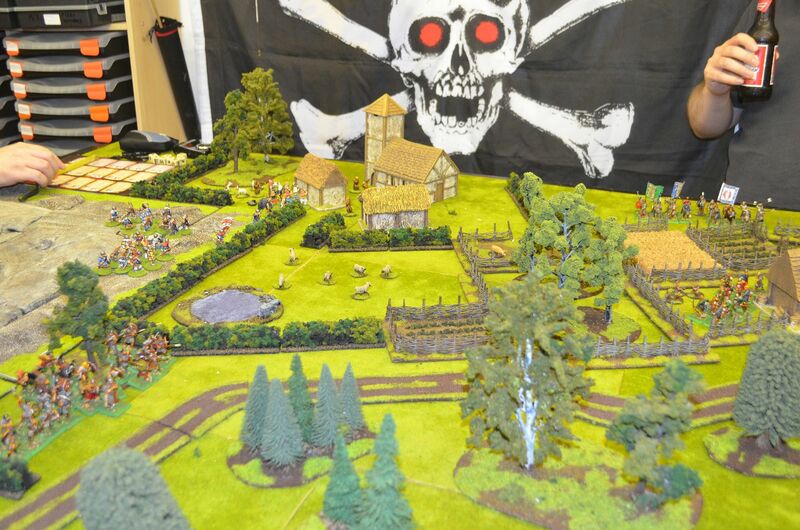 I may even use the ruleset to develop the Robin Hood themed game. If you are interested in getting into the Saga theme a small recommendation. 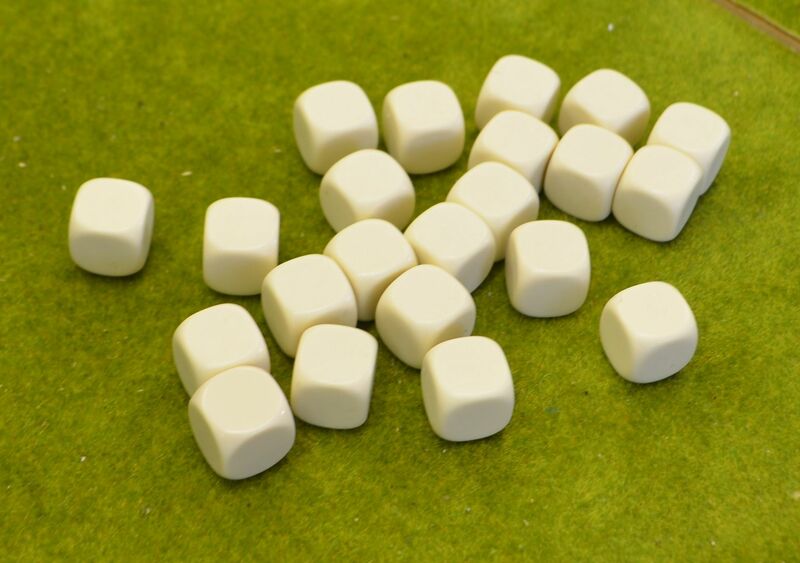 The Saga dice are expensive £8 for a set of eight custom dice. Wanting to test out the other boards (I only have Anglo Dane & Viking Dice) I sourced 24 plain unmarked dice on the internet for £3. When I get round to it I’ll draw on the symbols using a permanent marker. To be fair to the publishers they do suggest this as an alternative. On the domestic front I am trying to curtail the purchases for my hobby but certain events have conspired to get in the way. I was saddened to hear the demise of Modelzone on the high street and I did feel a little guilty when I visited my local Kingston store top see what could be had for a bargain. Some £200 later I bought a lifetimes worth of paint, woodland scenics and other various bits and bobs. Working on the principle that these would get used one day I thought it was a worthwhile investment. Frustrated by the demise of this chain I even wrote to the founder of the business, who was rumoured by the press to be interested in a takeover. 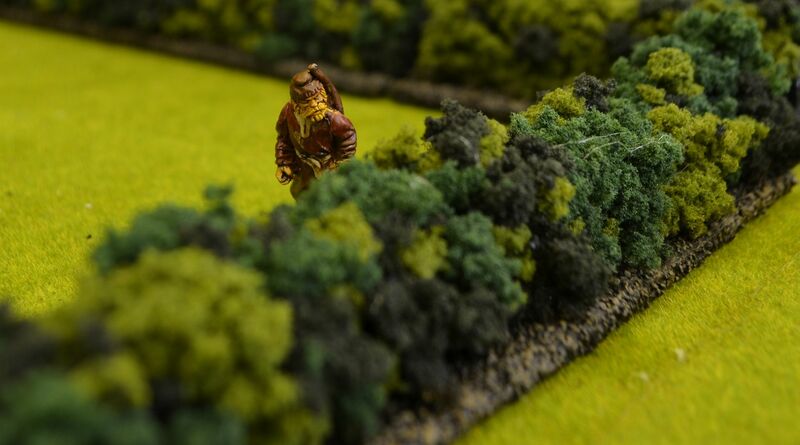 In my letter I highlighted the Wargames opportunity that I had always felt had been missed by Modelzone in the years that I had frequented the stores, and I went onto suggest that if the rumoured takeover were to take place I could offer my services as a consultant to bring this offer to life. With a senior management background in retail, marketing and above all a passion for the hobby I genuinely felt that I could add value to the business. Needless to say I never received a reply. It always amuses me that there are probably plenty of retail businesses out there that benefit from our hobby and are probably none the wiser that some of their customers are buying their products for a use they hadn’t even considered. A good example of this are the ranges sold by aquatics centres for fish tanks. Its my guess that a small but significant proportion of stone ruins, plastic plants, and other paraphernalia never end in a tank but end up on a wargames table. I am also bemused as to why individuals fork out small fortunes for this sort of stuff at the various shows when a trip to the local aquatic store will reap much bigger savings. This scenario would see two Warlords pitted against each other a find of Roman Gold. An old Villa complex lies in the middle of disputed territory. Whilst looking for stone some local peasants discover a chest of Roman Gold. Realising that they cannot shift it themselves they run back to their lord and tell him of their find. 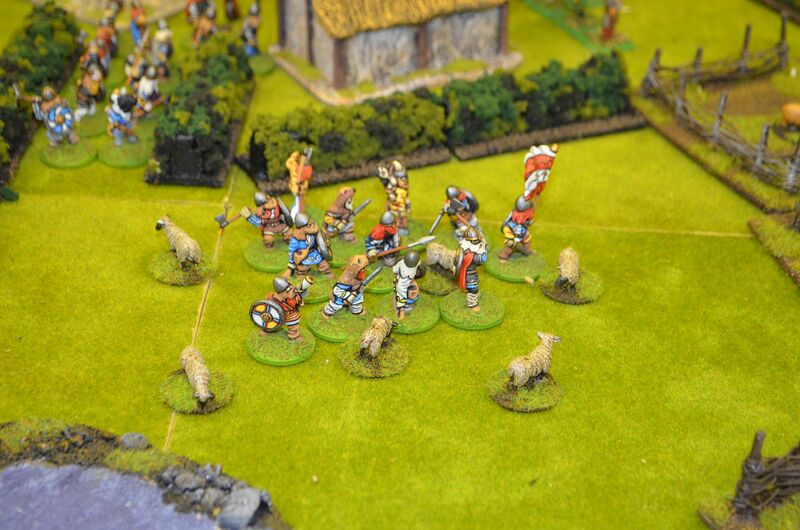 Wanting the treasure for himself the Viking chieftain despatches a unit of his hearthguard and a levy of thralls to take control at the ruins whilst he gathers his remaining forces. However the news of this glorious find has spread like wildfire and a local Anglo Dane Lord also wants the spoils. So the scene is set. Both forces have six point warbands. 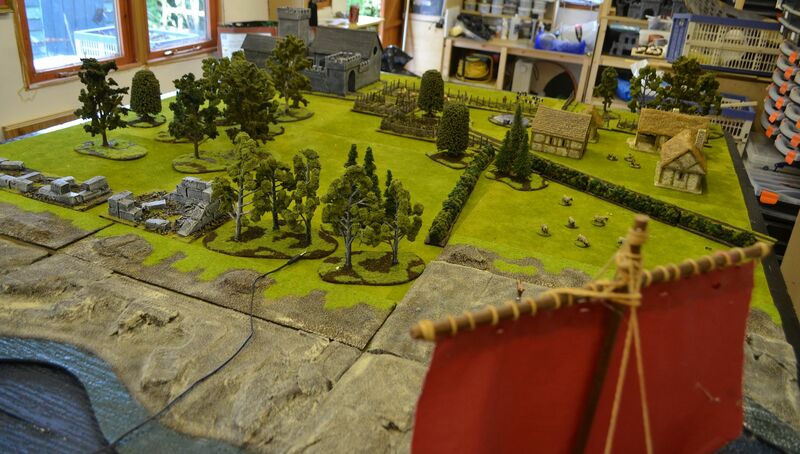 These forces arrive in turn one from the defenders side of the table. To begin with I moved my forces forward towards the ruins. With my levy protecting my right flank from the trees I was hoping to charge the ruins with my ‘heavies’ and sieze the treasure early on. The only comabatitive action in the first round were the Viking levies firing from the ruins into my super heavy hearth guard unit. Thanking my shield wall only one man succumbed to the Viking bows. I loaded up my battle board with some rather tasty treats, another Shield wall, hard as iron to reroll failed defence rolls, and the ‘Push. Throwing my tough Hearthguard against the Viking levy some serious dice rolling saw 6 of the lightly armed troops fall in a spray of blood. 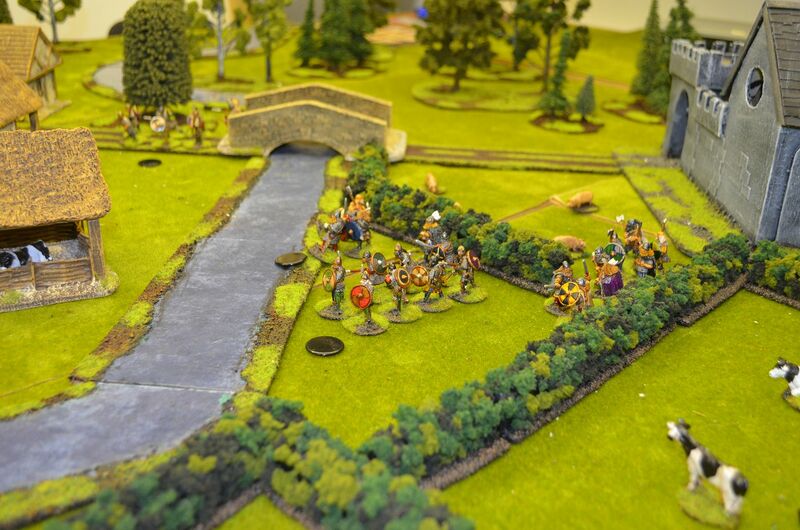 With the shieldwall protecting my guard from the levies defence I suffered NO casualties. Victory was mine and I played the coup de grace on the levy unit – the Push. Effectively this gave me a free attack with no defence and another three thralls hit the dirt. 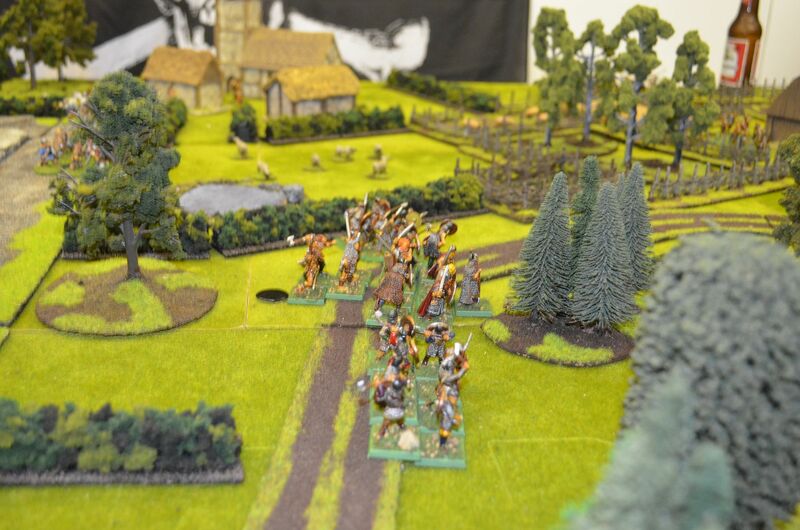 Realising that my guard were about to seize the ruins for little cost Mark threw in his defending guards, although outnumbered they downed three more of my men before succumbing to my axes and swords. 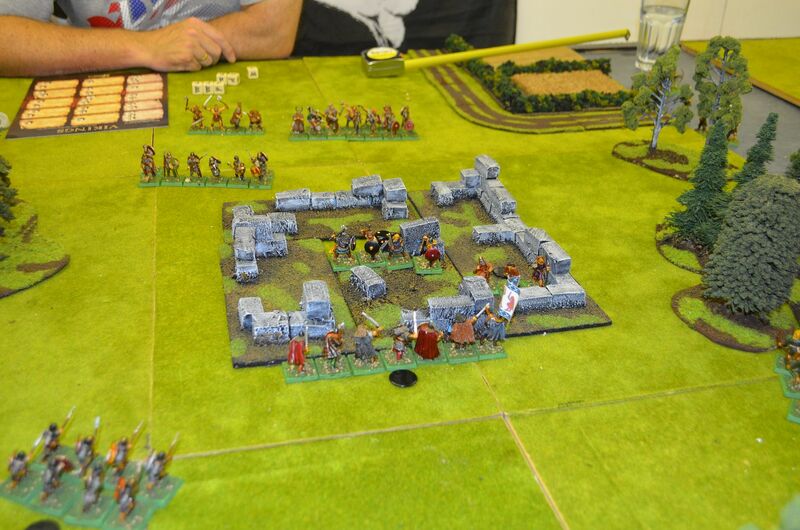 In the space of one round my large Hearth guard unit had wiped out a smaller guard unit and all his levies. I was having fun ! Time to consolidate my gains. My levy finally got into position in the left hand woods. I moved up may warrior units to cover my left flank and I sent my remaining hearthguard into finish off the skulking levies. Meanwhilst Mark was steadliy advancing with his troops into the ruins. Realising that I was running out of time (only seven rounds for the game) I hastily moved up my remaining warriors and hearthguard. By now Marks Vikings were in the ruins and he threw a unit of warriors up against my victorious guard. A boodfest followed and I was lucky to escape with one man remaining. His guard also lost three men so a draw in the melee was recorded. 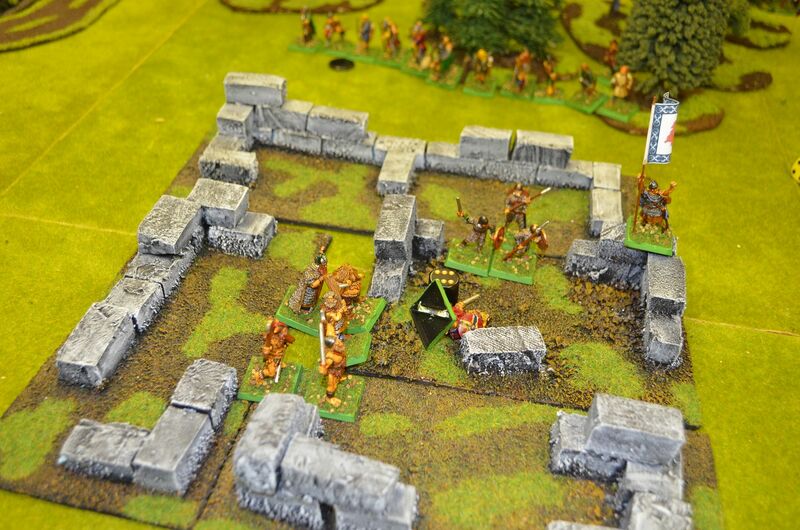 By now my Warrior units had arrived at the ruins and I threw the first unit into combat against the opposing defenders. A few dice later and neither side had given ground. 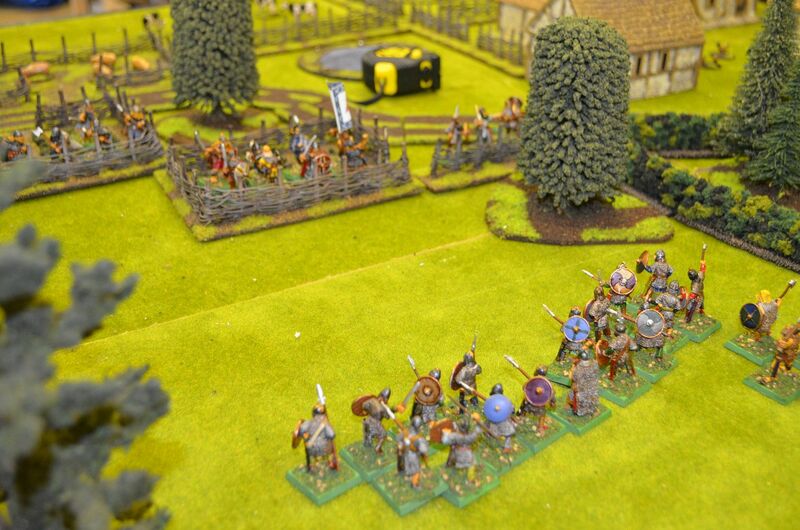 However this soon changed as a second Viking unit joined the fray. Beaten but not destroyed I was really struggling to get into these ruins. 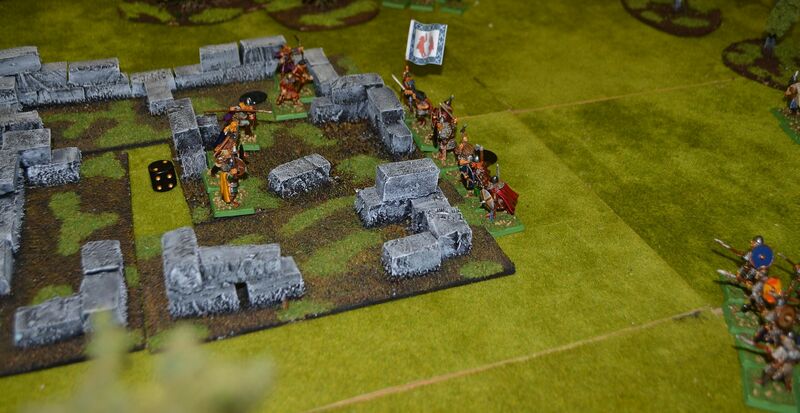 Again a fruitless melee ensued on the walls of the Roman site with neither side gaining the break they needed. Could I get my forces within 2 inches of the chest and force a draw? 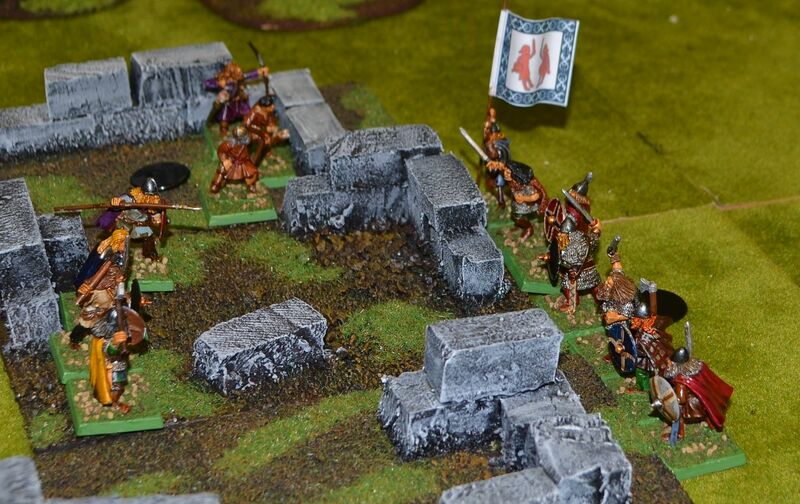 Loading up my last hearthguard with activation dice and battle board nasties I charged the remaining Viking units. With my Warlord leading the dash, my Dane Axes swept all in front of them. A units of berserker fell swiftly and I was in reach of my goal. 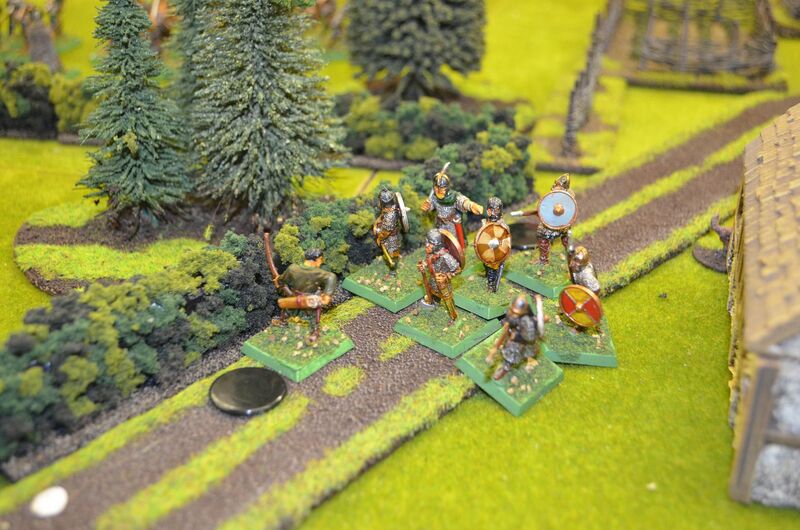 However such ambitious plansd have a cost and two of my brave guard had fallen at the last hurdle. 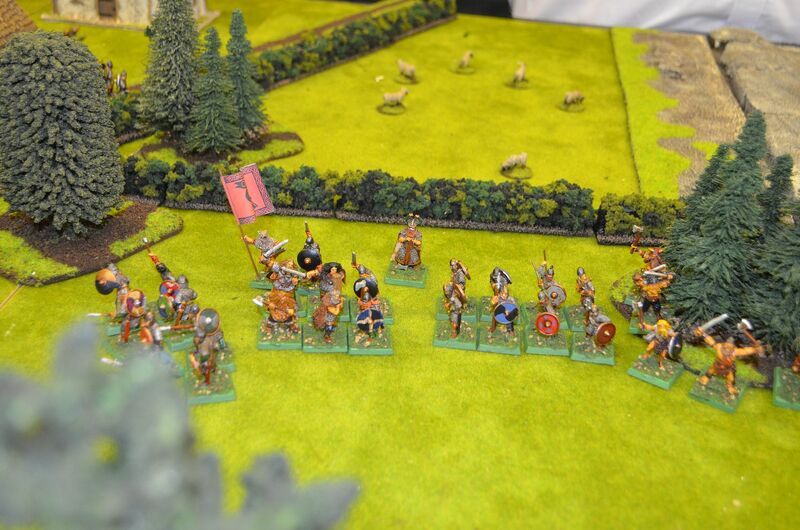 All I could hope was that Marks Vikings could not force my troops back in their counter attack. 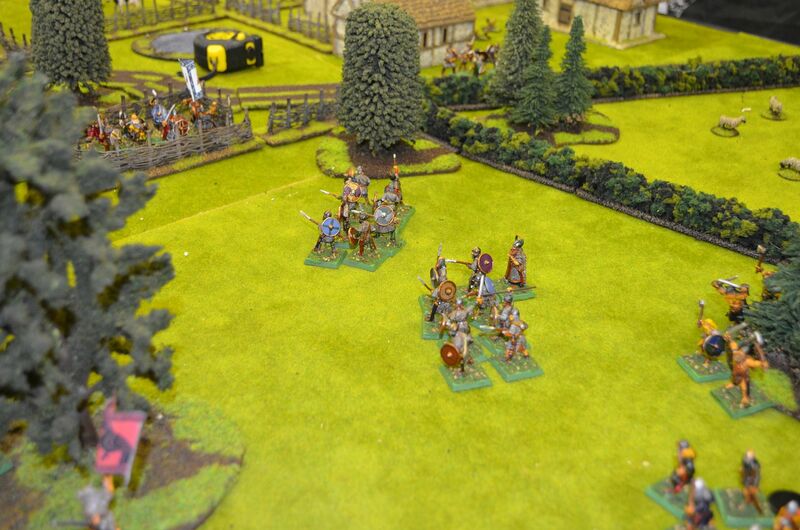 Alas he got the dice he needed and within minutes the second Berserker unit crashed into combat with their warlord. My die rolling was atrocious as my Warlord and remaining bodyguard were sent forth to Valhalla. The Vikings could claim the treasure. 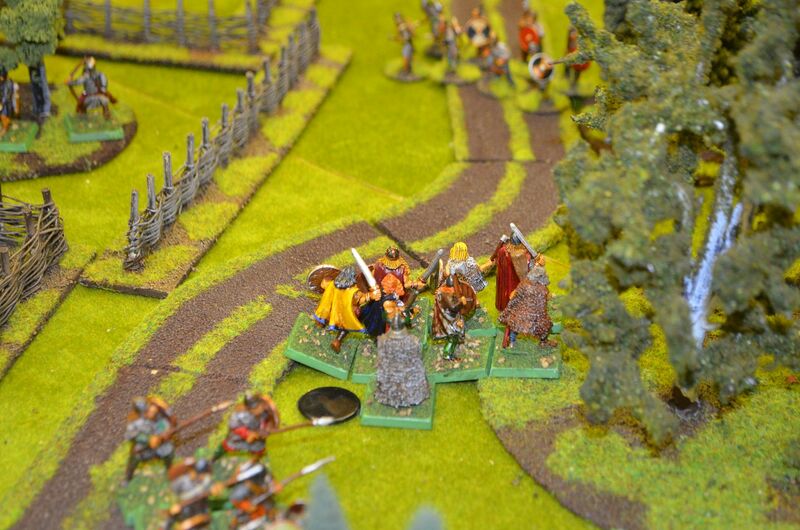 Despite a much higher bodycount they had emerged victorious – eight Vikings stood proud whilst 22 Danes beat a hasty retreat. Revenge will be mine ! Well after my disastrous attempts at fixing the clump foliage using PVA glue as reported in the last post I finally found a way to fix the hedges. A quick trip to B&Q (large DIY chain) revealed all sorts of wonderful glues, wanting to make sure that the product dried clear I picked up this product. It flows from the tube like a liquid toothpaste and certainly does the job. Not only has it fixed the clumps to the battens is seems to be holding the firm. I would recommend however that this is done outside as the product somewhat stinks. So in the space of about an hour nearly four metres of hedges were finished. I still sprayed scenic cement over the top to be sure. The edges were then dry brushed browns to finish them off. Up next are the corners and t junctions required. These have been finished in exactly the same way. Finally managed to get some more painting done – despite the hot weather drying out paint faster than I can apply it. 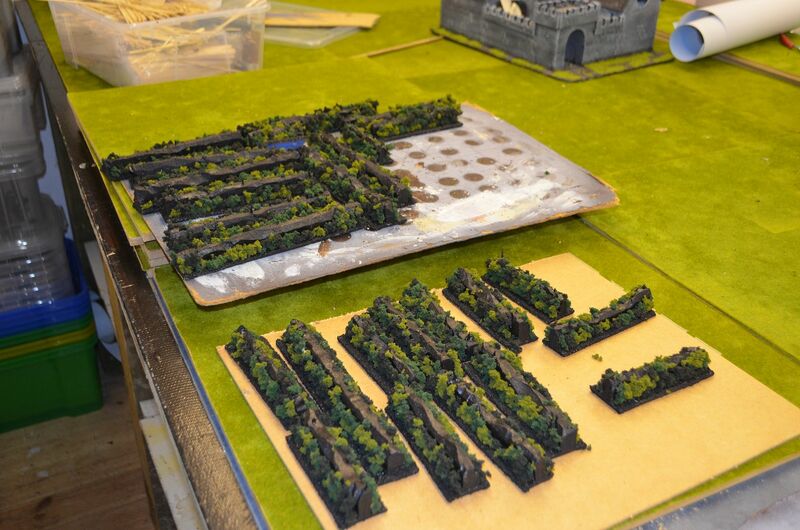 In this 2 part article I shall talk about the making of hedges. 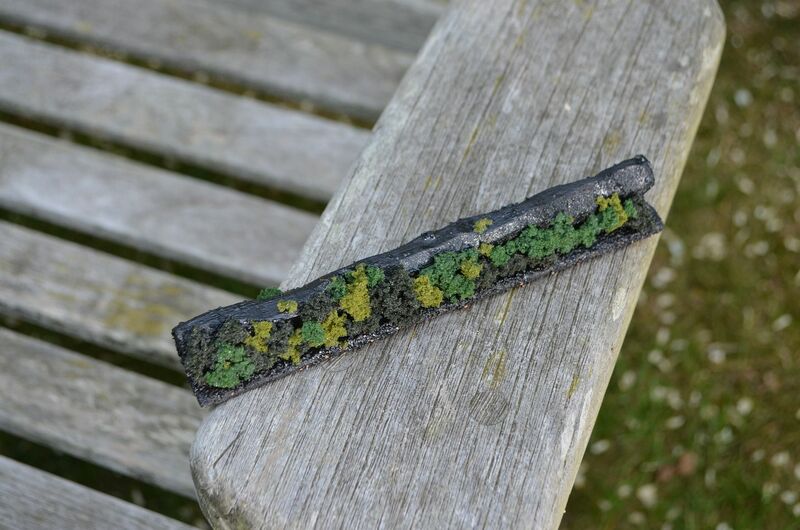 In the past I had previously used the old green pan scourers, lichen and thin strips of coir matting, but none of these gave me the visual impact I was looking for. 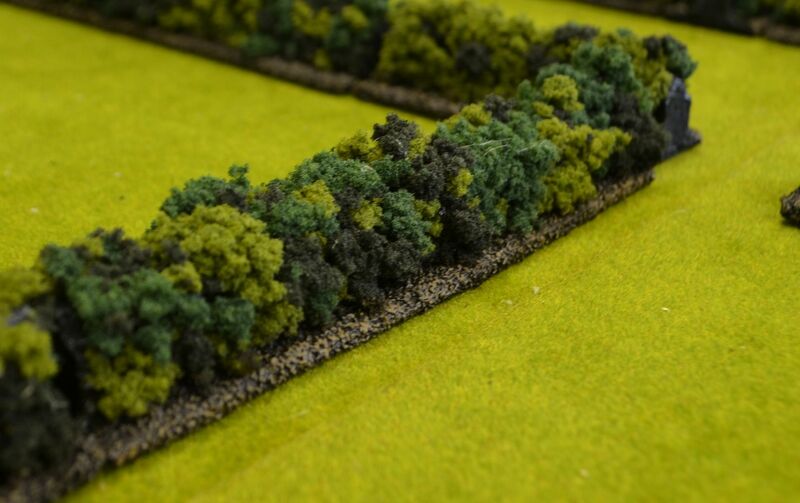 So prompted by the recent sales at Modelzone (A UK retailer that has gone into administration) I purchase a significant amount of clump foliage – probably too much. With this I intended to make the ‘mother’ of all hedges. As most of my readers , followers and friends know I tend to go for quick fixes and easy solutions. This project started out as such but as you read through this post you will begin to realise that this was not the case. 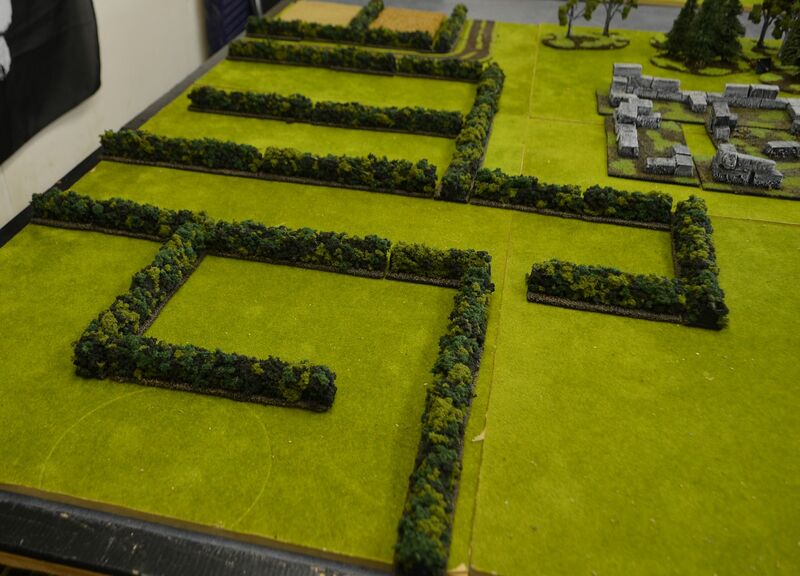 First up I decided I would make around 4metres of straight hedges – each length variable from c5cm to 20cm in length. 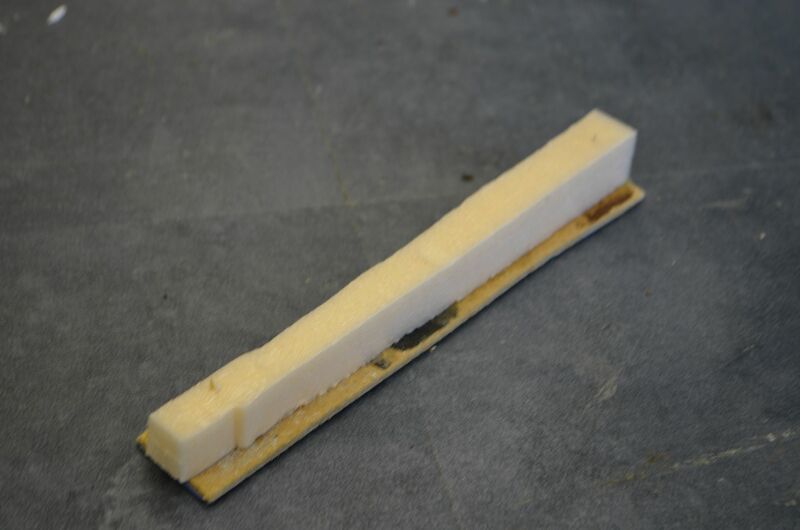 The base was cut from hardboard. Through this was drilled three holes and bamboo fixing posts opushed through to a height of 1.5cm. Onto to these fixing posts I glued (PVA) strips of pink foam. I cut the strips using my hot wire jig and made sure that the tops of the foam had a wavy form. This way the hedge would not look too uniform when finished. 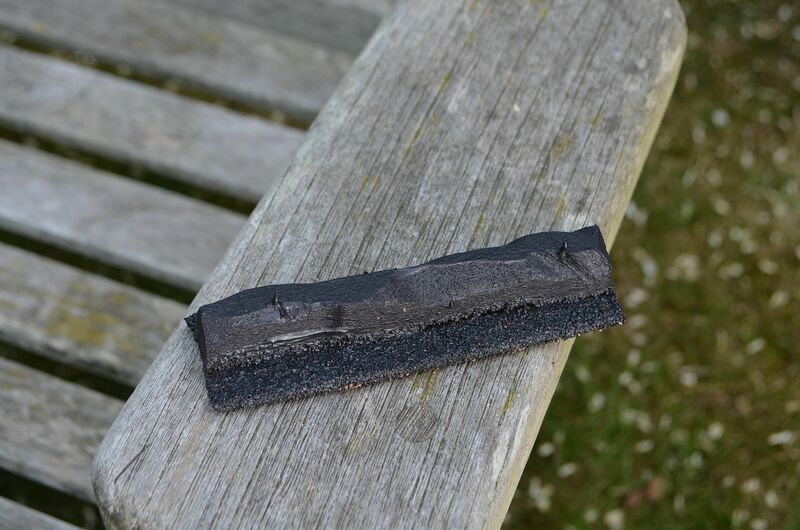 Next up I treated the side edges with ballast and sand and then painted the whole think matt black. I had bought three colours of clump foliage – light, medium and dark green. The clumps themselves vary from 2mm to 5mm in diameter. 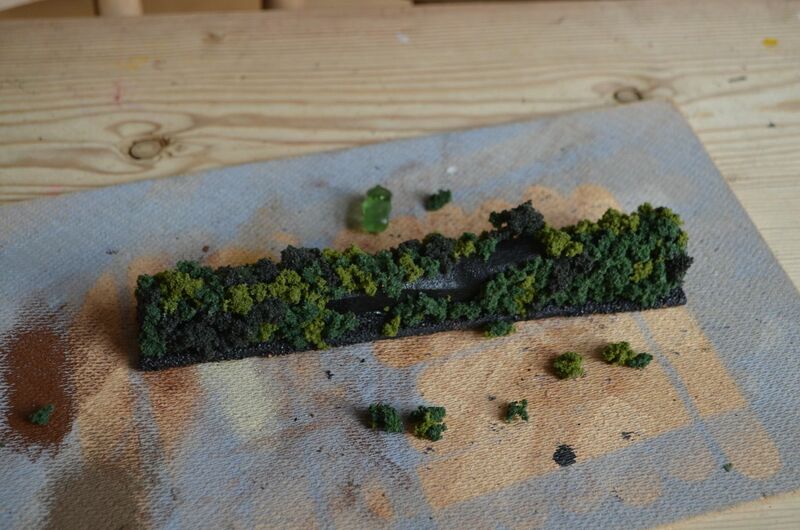 So I painted PVA onto the hedge support (pink foam/now black) and bgan to stick by hand the clumps onto the terrain piece. God knows how many hours later I had covered most of the pieces on each side with just the tops to do. I left these to dry. On my return I discovered that not all the clumps had glued securely. So rather than start again I spray soaked what had been done in scenic cement – hoping that this would permeate through and create the bond I was looking for. Once again I left to dry – the scenic cement had not had the desired affect. 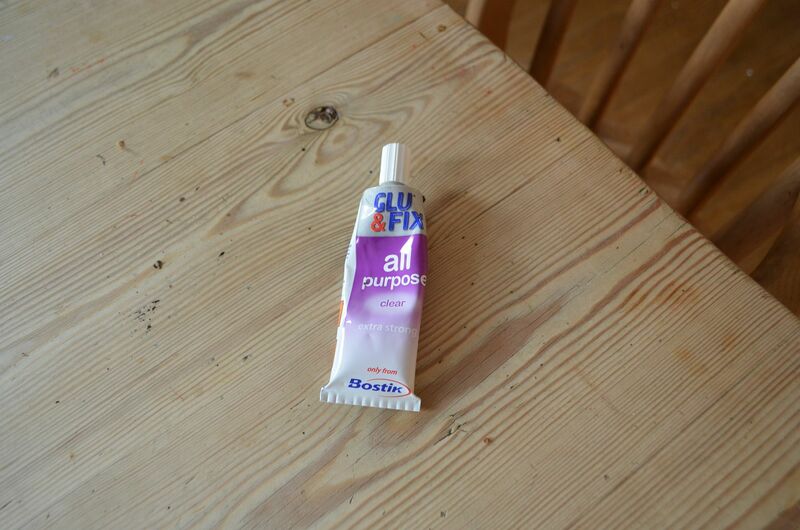 So this time I took one piece and soaked this using a brush in diluted PVA (50% water) – did this work? No – AAARGH ! 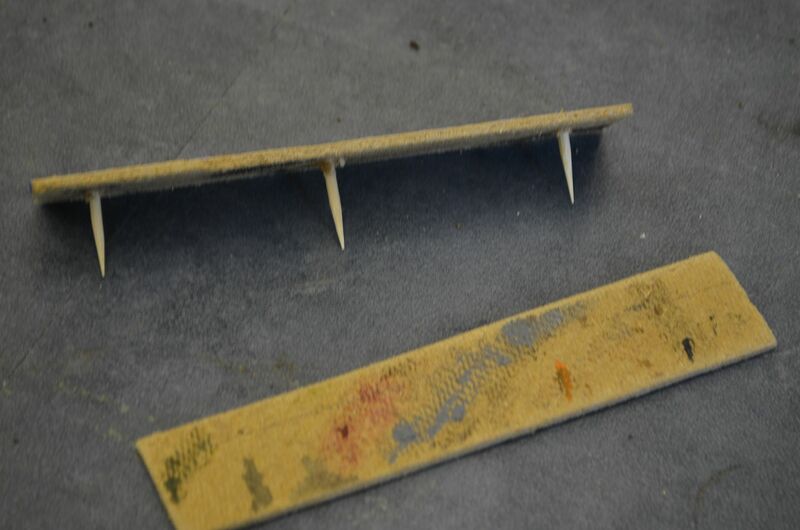 How many hours wasted – the PVA is just not holding the clump foliage to the boards. I am not sure whether this is a combination of the matt acrylic I have used, the heat (temperatures around 30 degrees) or the porous nature of the clump foliage itself. I suspect the latter. Did I mention that this lot will now need to be scrapped !